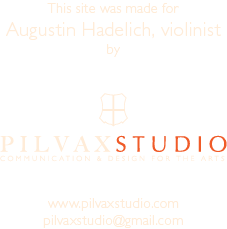 In the program’s first half, the gifted violinist Hadelich returned as soloist, this time in the Berg Violin Concerto, “To the Memory of an Angel.” […] Hadelich’s phrasing was eloquent, and he displayed a romantic tone on his Stradivarius violin. Technically, there was no feat he couldn’t master, and he did it all with effortless beauty and pristine intonation. The first movement evoked the child Manon with dance-like episodes, where his playing was spontaneous and expressive. The sensational return of the 30-year-old violin virtuoso to Music Hall was just one highlight in Friday’s Cincinnati Symphony Orchestra concert. […] Those, along with Hadelich’s showstopping encore, Paganini’s Caprice No. 5, had listeners on their feet three times, cheering. Mendelssohn’s Violin Concerto in E Minor, which combines engaging melodies and virtuosities, is one of the most oft-played works in the repertoire. The CSO has performed it since its first season, 1895. In a field of many rising stars, Hadelich stands out, not only for his stunning technique, but also for his refreshing individuality. […] Hadelich brought a sense of discovery to every phrase of Mendelssohn’s music. He projected a romantic, old-world style in his phrases and communicated with feeling to the very last row. One could revel in the fresh, sweet tone he projected on his Stradivarius – the 1723 “Ex-Kiesewetter.” The slow movement was breathtaking, and I’ve never heard such a conversational tone leading into the finale. There was also momentum, and he pushed the limits of tempo. The violinist tackled the finale with a dazzling display of speed and fairy lightness, smiling as he leapt through one technical hurdle after another. Mena was an excellent partner, and the orchestra never overpowered the soloist. […]The evening’s sensation on Saturday was a 27-year-old violinist named Augustin Hadelich, who performed Haydn’s Violin Concerto No. 1 in C Major. […] He has already recorded the complete Haydn concerti for Naxos, so it was no surprise that he would possess drop-dead technique. But combined with the beauty of tone that he projected on his rare, 1723 Stradivarius, “Ex-Kiesewetter” and the joy that he communicated in every note, his performance made for an unforgettable debut. Even though there were fireworks in his cadenzas, the most breathtaking moment came in the serenade-like slow movement, where Hadelich phrased with enormous beauty against the pizzicatos of the Cincinnati Symphony strings. It was a winning collaboration. Lintu put down his baton and led the reduced orchestra in a stylish performance of this work that straddles the worlds of baroque and classical. For an encore, the violinist dashed off Paganini’s fiendishly difficult Caprice No. 24, displaying nearly all that is possible on a violin, and then some.